Trellech is rich in ancient monuments, three of which, Harold's Stone, the Virtuous Well, and this motte, are celebrated on a remarkable sundial of 1689 which now stands inside the church. 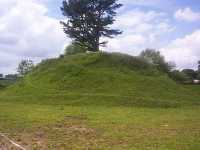 The motte is a large, earthen steep-sided circular mound. The ditch that originally encircled it survives only on the north side. All traces of the bailey have gone. The history of the castle is obscure; but it is known to have been in existence before 1231. Trellech was within the Norman lordship of Usk, and the castle presumably had some manorial administrative function. A Norman town was planted here by the de Clares and flourished in the shadow of the castle. By 1288 its population was larger than that of Chepstow, and at the beginning of the 14th century it was one of the eight largest towns in Wales. Thereafter it declined and shrank, but its former success is attested by its large church, which had a fine late medieval cross in the churchyard. Cadw Series: Guide to Ancient and Historic Wales, Glamorgan and Gwent, 1992.